As I can add other foreign currency? In the forms of purchase or exchange, does not appear the option "Chilean currency" (CLP) .. 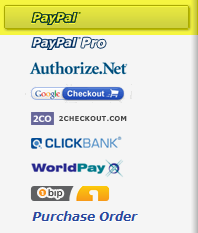 Unfortunately, it's not possible to add other foreign currency in our Payment field. However, I will send a ticket regarding on this request. IS VERY IMPORTANT THIS REQUEST!!!! Where do you want to add the CLP currency option? We need this information to proceed with your request. Please note that the CLP currency option can not be added to our PayPal Payment option, due to the fact that PayPal does not provide native integration for that currency. In the template "Purchase order form" is to have your own form of shopping. Thanks for the information. Request has been forwarded to our developers. We will let you know as soon as we got updates. Thank you very much and congratulations for this website and your solutions!